On February 5th, 1925, Officer Haze Burch became the first Phoenix Police Officer killed in the line of duty. Officer Burch was shot by two men attempting to siphon gasoline from a car. Officer Burch died the following day. The assailants were later identified as two fugitives from Oklahoma wanted in the murder of a deputy sheriff in Texas. 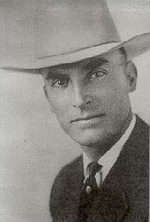 Governor W.P. Hunt and the city of Phoenix each offered rewards for the assailants who were later captured. Officer Burch was survived by his wife and three young children. It would be twenty-seven years before another officer was killed in the line of duty.